HAR has put together a real estate report comparing July 2017’s statistics to July 2018’s, and it is very informative for individuals looking to sell their home. This article is to show you data for the current real estate market in Houston, showcases some of the reasons why this newly released data can help you understand the housing market, and give you an advantage over the competition. 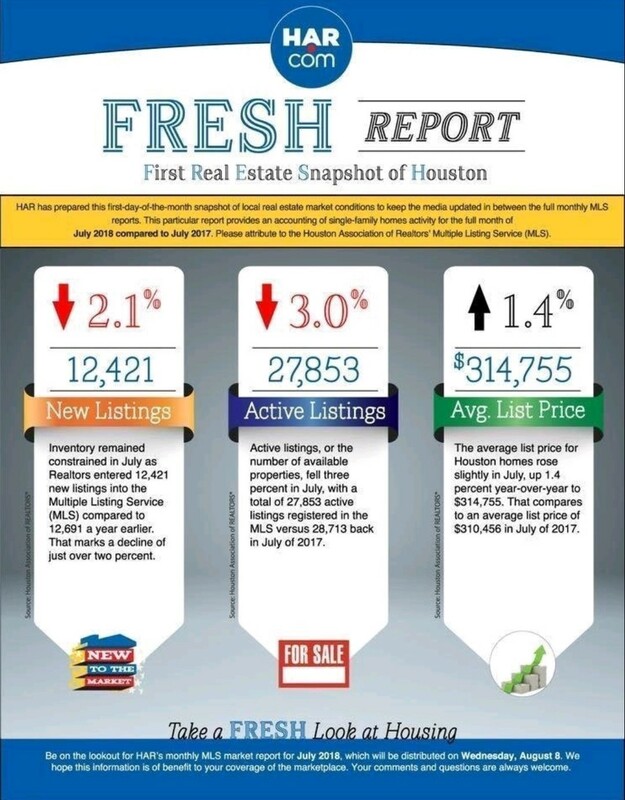 When comparing July 2017 to July 2018, listings in Houston are down 2.1%. This may sound like a negative statistic, but this is promising for you if you are looking to sell your home this summer, as it will not be up against as much competition. Buyers looking to purchase a home in the Houston area will have a higher chance of considering purchasing your property, making your home seem much more desirable. Active listings are down 3%, with a total of 27,853 Houston listings registered to the MLS. Again, this statistic may sound like a negative one, but this drop in registered properties will make anyone looking to sell their home quite happy. When there are less homes on the market, your property becomes much more desirable to people looking to purchase a house, and can also increase the value of your home. The average listing price for Houston properties is up by 1.4% from July 2017. Last year the average home listing price was $310,456 and the current price is $314,755. These higher prices can be a great reason to hurry and get your home on the market, as you will benefit from the rise in the average listing price this summer. These changes in the market from July 2017 to July 2018 are exciting if you are looking to sell your home and get it onto the market. Getting your home on the market can seem like a confusing or complicated procedure. If you have any questions about selling your home or if you have any other questions about real estate, you can contact me here.